On Saturday, June 8, the exhibition, “Christian art in Serbia in the period of the Edict of Milan” opened in Luxemburg, reports Sedmitza.ru with reference to the French Orthodox website Оrthodoxie.com. The exhibition has been prepared within the framework of the celebration of 1700th anniversary of the Edict of Milan. It has been organized by Priest Zoran Radivojevic, the Rector of the Serbian Orthodox parish in the capital of Luxembourg with the blessing of Patriarch Irenej of Serbia and Bishop Luka, the head of the Diocese of Western Europe of the Serbian Orthodox Church. Its exhibits have been created by modern iconographers, restorers, and artists, as well as students of the Academy of restoration and conservation of the Serbian Orthodox Church in Belgrad. 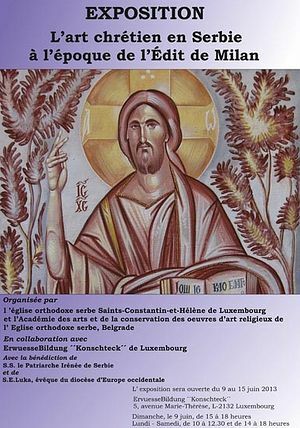 Bishop Luka of Western Europe will head the opening ceremony of the exhibition in the presence of Orthodox clergy, representatives of religious denominations, and civil authorities of Luxemburg. Jean-Claude Larchet will present a report on the holy Emperor Constantine and the Edict of Milan. After that, the exhibition will be presented by its curator, Goran Janicijevic, an iconographer and teacher in the Academy of Restoration and Conservation of the Serbian Orthodox Church. This academy, together with the Theological faculty of the University of Belgrad, has taken part in the preparation of the exhibition.